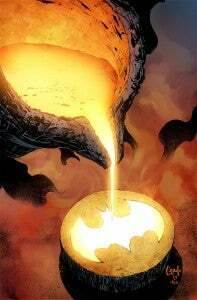 As Scott Snyder and Greg Capullo enter into an ambitious, 11-part story that will carry them through the middle of 2014 and reinvent Batman's origins, the pair have already got stories planned out that would keep them on Batman past issue #40, they revealed to the Batman: The Zero Year panel at WonderCon today. Capullo has reportedly signed a new exclusive deal with DC Comics that stipulates that he can write Batman and that the publisher cannot reassign him if that's his inclination. The pair have plans that would carry them through #48 or #49. Of course, if a best-selling and fan-favorite creative team runs out of ideas at #49, you can bet there will be a game-changing #50. As for the Zero Year itself, Snyder described the story as like nothing fans have seen before, and explained that the idea came to him because he realized that the compressed timeline of the New 52 rendered the events of Frank Miller and David Mazzuchelli's seminal Batman Year One impossible. "If I write Year One, you'll get a poor version of Year One," the writer said of why he's taking on an entirely new approach to Batman's backstory. If I try to do things like the pearls or the lamp, it's just a poor imitation. It's impossible to reach a masterpiece like that. We are giving this our best effort. I've never worked as hard on anything."